Yesterday at Base Camp, not long after the Camp III climbers arrived weary form their long descent, the radio crackled and I heard Ang Temba’s voice come over the radio from the top of Kala Pattar. He, Chuck, Sally and Wendy were proudly reporting from the top. At the same time I told them how proud I was of the climbers for their time spent high on this rotation. 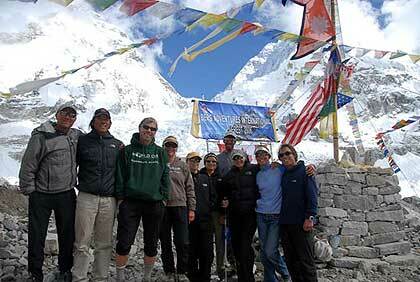 I keyed the radio and the climbers got to hear cheers of congratulations from the Kala Patar summit team. 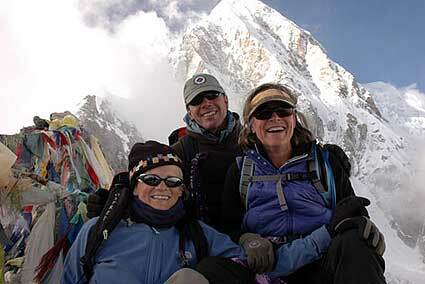 Then congratulations were sent back from Base to the Kala Patar summit. As Kit said, we did not have the energy to climb that when we were coming up here! At about noon today, the whole trekking team, Catherine, Linda, Chuck, Sally and Wendy came into their new home for the next two nights. They were accompanied by their friend Madeline Martindale, one of the physicians from the HRA clinic. 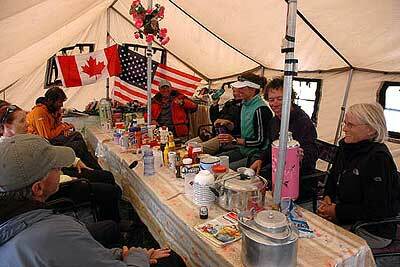 We just enjoyed a nice evening in the dining tent, sharing a meal and stories of our adventures. Now as a full moon rises over the Lho La we are settling down to a cold but cozy night with brilliant starlight and gleaming glaciers above. It is great to be together.